Red Wing, Minnesota. 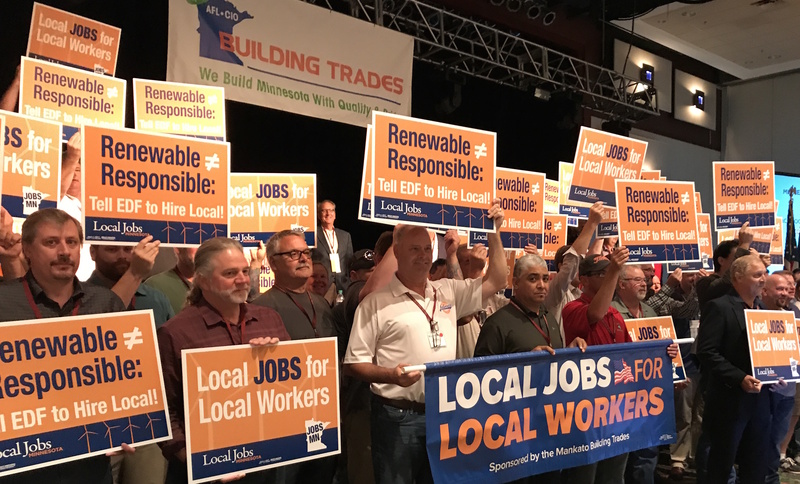 (July 28, 2017) – Leaders of Minnesota’s Building Trades unions today called on the developers of renewable energy projects to commit to the creation of high-quality jobs for Minnesota workers and use of responsible contractors, as part of an action involving construction union leaders and members from across the state. The unions, which represent tens of thousands of skilled construction workers statewide, are critical of renewable developer EDF Renewable Energy for “betraying local workers” by hiring a general contractor that apparently relies heavily on out-of-state workers to build Red Pine Wind, a 200 MW windfarm that is currently under construction west of Marshall, MN. Union construction workers assembled on the morning of Friday, July 28, at Treasure Island Casino, during the Minnesota Building Trades’ 71st Annual Convention, to make a show of solidarity before voting for a strongly-worded resolution calling for the commitment of owners and developers of renewable energy projects to employ local workers and provide area standard wages and benefits. “Whether it’s taconite, precious metals or wind, we believe that Minnesota’s natural resources should be used to put Minnesotans to work,” said Harry Melander, President of the Minnesota State Building and Construction Trades Council. “We have the most skilled and productive construction workforce in the country, and there’s no excuse for bringing in hundreds of out-of-state workers to take food off our tables." “I spent half a year building Prairie Rose Windfarm,” said Garritt Thomssen, a member of Operating Engineers Local 49 from Lake Benton, MN. “There were dozens of locals on that project, and I thought Red Pine would be the same. But you look at the license plates: California, Oregon, Texas. To be honest, I can’t think of a single person from our area working on the project. We’ve got skilled labor and we need the jobs, so I don’t understand why EDF would shut us out.” “Wind power is not a new frontier anymore. Local workers have as much experience as anyone,” according to Jim Nichols, a former State Senator and leading renewable energy advocate who also lives in Lake Benton. “Companies that want to leverage Minnesota’s wind resources can’t ignore the potential contributions of local workers. If you want to be a good steward, you need to look out for local communities and workers as well as the environment. ATTENTION EDITORS and REPORTERS: Interviews with these and other newsmakers can be scheduled with Robb Leer at 612.701.0608 or [email protected]. For additional information please visit http://www.LocalJobsMinn.org/ or find Build Better MN on Facebook. Be it further resolved that, while the Minnesota Building Trades and its affiliated unions will continue to support renewable energy projects that we believe will create high-quality jobs for local skilled construction workers, we will oppose future projects that we believe will largely exclude local workers from construction employment opportunities or put workers at risk as a result of unsafe or unfair employment practices.